Okay, I have written a few posts on asset allocation now. You might be wondering, “What does Michael’s asset allocation look like?”. That is a fair question. It would serve you well if you read these prior posts. I wouldn’t say it is a pre-requisite, but it will give you a good background and my thought process. #1 Do You Know Your Asset Allocation? #3 How Much Does 1% Cost You? 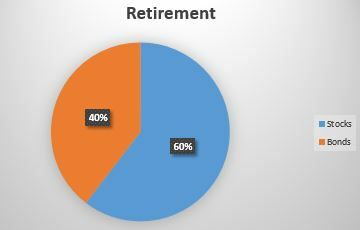 Here is what my retirement asset allocation looks like. This does not include my emergency funds, college education savings, or individual brokerage accounts. Yes, I follow my own rule book. If you read my post, Asset Allocation Rule of Thumb, you will know that the bond allocation should roughly match your age and the stock allocation should be 100 minus your age – just that plain and simple. If you are aggressive, you would have more in stocks, and if you are conservative, the vice versa would be true. Using this rule of thumb is a great starting point. VT – investment in world stocks including U.S. Tracks the performance of FTSE Global All Cap Index. IVV – investment in U.S. Large Cap Stocks. Tracks the performance of S&P 500 index. IUSV – investment in U.S. Value Stocks. Tracks the performance of Russel 3000 Value Index. Within the stock ETFs, you will notice that I have 75% of it is U.S. domestic (IVV and IUSV) ETFs, 25% is international (VT) ETFs. AGG – investment grade bonds within U.S. Tracks performance of Barclays U.S. Aggregate Bond Index. BNDX – investment grade international bonds excluding U.S. Tracks performance of Barclays Global Aggregate ex-US Float Adjusted RIC Capped Index. Within the bond ETFs, you will notice that I have 75% of it is U.S. domestic (AGG) bond ETF, 25% is international (BNDX) bond ETF. #1 Every ETF that I have on my retirement account is pegged against an index. It is very easy for me benchmark and track performance. #2 Every ETF has a very low expense ratio. #3 All these ETFs are from Vanguard and iShares – they are popular, have huge assets under management, and trade in high volume. So, buying or selling them is a breeze. I will provide an update towards the end of the year on my portfolio performance based on my current retirement asset allocation. Truthfully, a lot of this information goes over my head, but it’s good to know! What would be the best starting point for someone to learn? Where would you recommend they begin? Are you familiar with the book Tony Robins wrote about money? What do you think? Thank you for your honest feedback. This could be intimidating if you are new to investing. I have started a new series called personal finance checklist – http://stretchadime.com/personal-finance-checklist/. It is a great place for you to start reading and understand personal finance. I will be covering each of these topics through a series of blog posts. But like Lesly said it is good to know. Thank you! I have started a new series called personal finance checklist – http://stretchadime.com/personal-finance-checklist/. It is a great place for you to start reading and understand personal finance.